KID BEOWULF AND THE SONG OF ROLAND is the second in a series of graphic novels by Alexis E. Fajardo that uses history as a creative launching pad for wonderful storytelling. 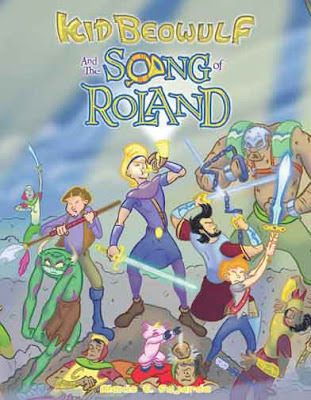 Set in the Middle Ages, KID BEOWULF AND THE SONG OF ROLAND is a rich stew of characters, stories and historical narrative of Europe around 750 A.D. Some of the story revolves around two brothers –– Beowulf and Grendel –– as they journey to France. But really this is an epic poem (turned into story via the graphic novel) of warring factions in the Frankish Empire and Hispania, and how Kind Charlemagne’s troops fends off their arch-enemies. It would take me far too long to summarize all of the storylines here. Suffice it say, Fajardo has pulled together a wonderful concoction of humor, battle scenes, betrayal and more as Roland (one of the Peers who defend the kingdom) must come to the defense of King Charlemagne. I was completely entranced by the story here in this book (which is longer than most graphic novels, I have to say) and now I find I want to go back to the first book in the series: KID BEOWULF AND THE BLOOD-BOUND OATH to see what sets the characters Beowulf and Grendel (the monster from the classic Olde English story, although here he is kind of cute) in motion since they play only bit parts in THE SONG OF ROLAND. The humor is a mix of Old English puns on names along with current topics, such as union representatives and obsessions with amusement parks. Add in a massive elephant who goes berserk, and you get the picture. I appreciated, too, that Fajardo includes maps of the Frankish and surrounding empires in 750 A.D. and I appreciated even more the two-page spread of characters in the book, since I began to lose track of who was who when I put the book down and returned to the story. Alexis E. Fajardo, who works at the Charles Schulz Studio, is clearly a talented writer and artist with imagination galore. His characters are well-conceived and his mix of seriousness, intrigue and slapstick humor (Beowulf and Grendel sometimes take on the role of Abbott & Costello, it seems to me) reflect a deep appreciation for both Looney Tunes and ancient stories of our culture. While the cover is awash with color, the inside pages are black and white, which may turn some students off (it shouldn’t but I find it does, unfortunately). This graphic novel might be a nice supplement for a unit on the Middle Ages (when countries were forever on the brink of war) but I think the book could go a long way if it made its way into the clutches of some of our advanced readers. It’s a great text that will stretch a reader, and I already have a current student in mind for this book. Video trailers for the graphic novel and an iPod App for the book series are available. I highly recommend this book for a library in middle or high school classroom. I think the story might be a bit too much for most elementary classrooms in terms of content. There is some sword fighting and cartoonish violence, but nothing too inappropriate. A follow up: I gave the book to one of my students, who devoured it in a single day, and gave it a hearty thumbs up.